Technology? Content? or Instructional Design? Our 'platform' is all of the above. 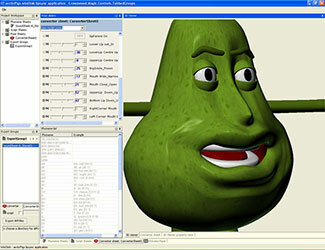 It is essentailly our internet 3D animation engine integrated into a browser environment. Add to this an editor application to enable integration of multiple media streams and add interactive elements, plus a lipsync tool and animation production workflow, and you have what we call 'the platform'. We created an inegrated rich media environment that could render powerful 3D visualisations, compelling process simulations and engage young minds with humour and craziness, just the way they like it - while being rich in graphics quality and narrative style. Technology makes new kinds of compelling experiences possible. As the tools and navigation become an integral part of the learning process and the definition of 'content' becomes stretched, technology remains an enabler of experiences, the key is design. We looked to connect with the world that is emerging, the one they inhabit and within which they will evolve. Production values, form and usability (access) is the basis of the 'voice' a two way means of communication, articulation, expression and ownership. Modern youth culture is centred on communication, choice and control and as such they are central design issues. An interactive exploration of absorption. Real time animation has a proven capacity for immersive experiences, as demonstrated by the games industry. Our 3D graphics format is based on spline and patch technology, achiving the smooth look and organic deformation essential for the creation of compelling 3D character animation. The surreal humour of the characters in 'Organisms,' our animated 'biological' soap opera, adds context and meaning to learning materials, while providing tutors with powerful hooks for classroom communication. ...complex learning paths and learning style adaptive framework. Remarkable graphic simulations are integrated into the browser environment, offering insight into complex processes while facilitating the construction of complex learning paths and learning style adaptive framework. (multiple media streams). Our graphics format achieves tiny file sizes compared to standard games formats, while maintaining a smooth look and organic deformations so essential for emotional engagement with 3D characters. These features, when combined with the complex interactivie capacity inherent to real time 3D environments, makes our technology perfect for internet 3D animation applications. ...real time full screen interactive 3D character animation is a reality. Our PC Client application is actually two programmes, a viewer, for the end user experience, and an editor, which is really an integration platform. A full spectrum of media objects - real time 3D animation and visualisation, high quality 2D graphics, video, sound - integrated into a rich media database from which intuitive webs of interactive learning paths can be structured. With our supported code 'snippets' programming interactivity can be as simple as filling out a few drop down boxes to apply properties to model groups. In this way different models, actions or entire choreographies can be dynamically linked to each other or to any object in the browser window. This affords immense design possibilitites. We can add logic and structure to individual animations, creating association and structural meaning. Online teaching resource from the 'Nutrition and Digestion' module. Do you wnat to know what real time 3D can do for your learning or entertainment environment?